For Christmas I got Russell tickets for the Avenged Sevenfold, Buck Cherry, Papa Roach and Saving Abel concert .. So last night him and Jake had a little guys night! He said it was way cool, and when he got home he didn't have a voice so it sounds like it was! I am glad he had so much fun and he totally deserved it.. He thinks he is getting a tattoo of this bat skull thing(below) and I think not.. I freakin hate you! We just found out we owe 2,100 dollars for taxes.. Why?? For working our butts off.. For actually supporting ourselves and not depending on others?? I just would like to tell you thanks!! I told Russ I was going to just quit my job.. (Mostly so I can start going to kick boxing classes in the morning! But I blamed it on taxes..) Its just frustrating.. 90+ hours every check I work just to owe that much money?? Maybe we will adopt some children this year..jk! Thanks Lacy for doing our taxes and just go ahead and send them in, I have a feeling its not going to get any better! Sorry Honey looks like you will just have to wait a little longer for that dirt bike! 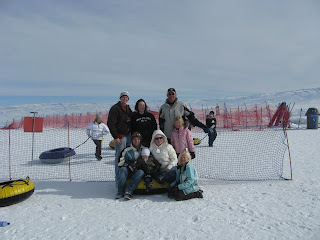 Today we went sledding with Russell`s family at Solider Hollow. 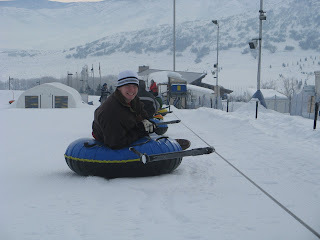 I have never been before, but now I cant wait to go back! 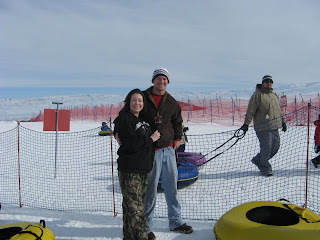 It was so much fun.. A little chilly but totally worth it!